Happy Christmas, Margaretha. 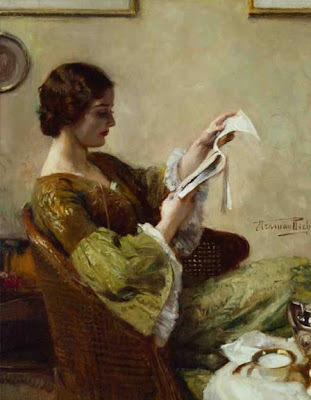 I would love to say that I am sitting reading in a glamorous gown like the woman in your picture today but I'm in my apron, preparing vegetables! Nobody would believe me if I said i was sitting reading in a gown like that. All my friends know that I'm more "homewoven" than that! Merry Christmas Em! I would never look like this woman either, and am intrigued by what she is reading. I hope you're having a wonderful holiday! It looks more like an magazine than a book - she looks as she would enjoy D.H. Lawrence's "Lady Chatterly's Lover".